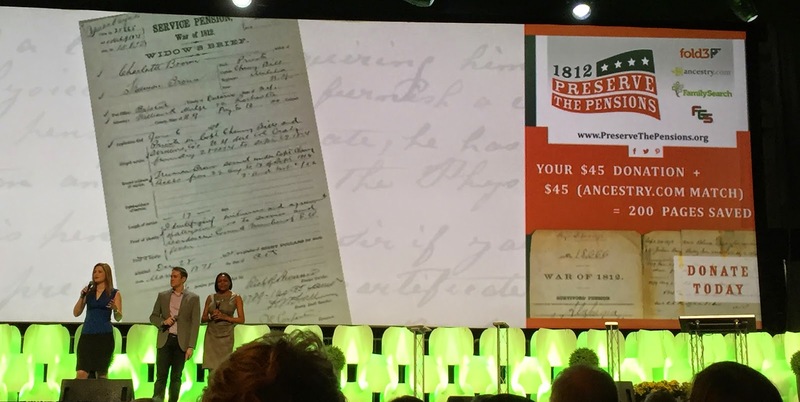 One of the key topics that I decided to pursue at RootsTech this year, was the topic of DNA. This was partly for selfish reasons as I have now tested with two of the three main companies (FTDNA and Ancestry DNA) and I wanted to try and better understand my results. But it was also because I believe that the launch Ancestry DNA in the UK earlier this year will have the effect of encouraging a much wider pool of genealogists and family historians in the UK to test for DNA. Up until now, I have pretty much ignored DNA in my professional genealogy work, leaving this to the "DNA experts". But I do not believe that this is necessarily a good move any more. I now see DNA testing as just one of the pieces of evidence that could be used to piece together a person's family history background, especially where brick walls are concerned, and that we professional genealogists should ignore it at our peril. Day 1 of RootsTech started early for me, at 7 am, for a VIP breakfast with FindMyPast. I was so pleased to discover, via a private Twitter conversation with Myko Clelland, that I was on the invitation list, even though I hadn't actually seen an official invitation (but I won't hold that against them). At the breakfast, FindMyPast made a few key announcements, one of which was a new partnership between FMP and FamilyTree DNA, the full press release of which can be seen here. So this was a great start to my DNA day at RootsTech. Unfortunately the details were, and still are at the time of writing, fairly sketchy and we don't really know exactly what this partnership will mean. However, as long as FMP will be marketing some sort of DNA test with FTDNA (which they suggest is the case), then this, along with the move by Ancestry UK into DNA, has to be good news. The breakfast also included a question and answer session with Annalies Van Den Belt, CEO, FindMyPast, where D Joshua Taylor, Director of Family history at FindMyPast posing her some of the more common questions which are asked of FindMyPast in the US. In accepting the breakfast invitation I had missed the Blogger's private visit to the Exhibition Hall, which I would have liked to attend, but then you can't do everything. 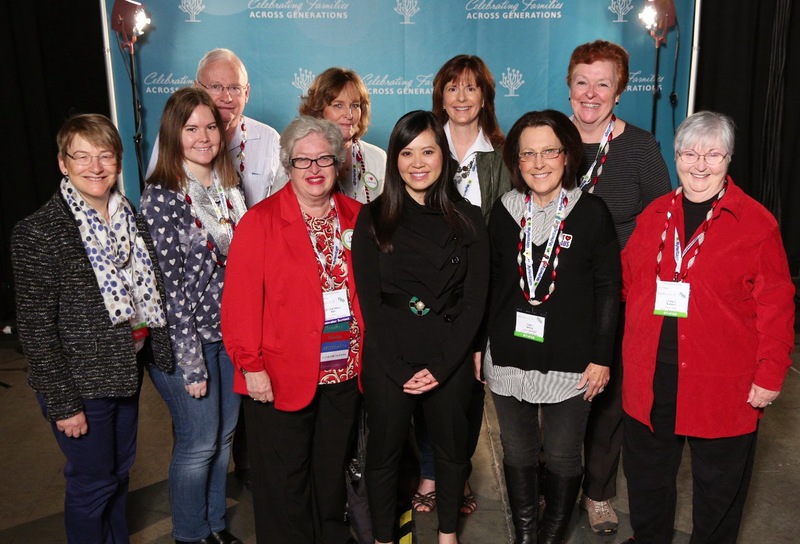 However, a friend and colleague, Tessa Keough has written a lovely blog post all about a first timers' experience of the RootsTech Exhibition Hall which you can read about here. Dennis Brimhall, CEO, FamilySearch, then continued the session, wowing us with various statistics about the growth of the RootsTech phenomenon and thanking many of the FamilySearch partner companies, including Ancestry, FindMyPast, MyHeritage and a newcomer to the mix, Family.me. (Note to Brits: no sign of our very own third provider TheGenealogist - perhaps I should contact them for next time!). Dennis Brimhall also described the brand new FamilySearch Discovery Centers, which had just been launched after successful beta testing, and which you can find out more about here. As well as the site in Salt Lake City, which I had already visited, FamilySearch is planning to develop similar centers in Seattle, Philadelphia, and also in London (via a partnership with FindMyPast). These centers are really aimed at bringing Family History discovery to a wider, and probably younger, audience, by appealing particularly to families. The Keynote session then continued with Mike Mallin, Chief Product Officer, MyHeritage, who talked about how MyHeritage can help people discover their own family histories, giving some very relevant examples from his own family and elsewhere. Now turning to the DNA side of things. I had already set up an interview session for later that day, with CeCe Moore and Angie Bush, genetic genealogists. I was therefore keen to do my background research! I had already attended (virtually) two very interesting talks at the APG Professional Management Conference in January, one by Angie Bush and the other by CeCe Moore. As I am a bit of novice when it comes to DNA, these talks actually blew me away with the complexity of the DNA science that they have successfully used in the US to discover the parentage of both adoptees and those with unknown parentage. I had also attended CeCe Moore's talk on the first day of the FGS conference (FGS Society Day), the day before the official start of RootsTech, entitled "Bringing Your Society into the 21st Century with a DNA Interest". Although this talk was mainly aimed at encouraging Family History Society's to start DNA Interest Groups (DIG's), CeCe did go over some of the DNA basics in that talk. However, for a really good introduction to basic DNA, I would strongly recommend Diahan Southard's talk, entitled Getting Started in Genetic Genealogy, which I didn't attend live, but which can be viewed on the RootsTech website here. In order to do my background research I also attended CeCe Moore's talk entitled "Exploring Family Stories with DNA from PBS' Finding Your Roots with Henry Louis Gates Jr". This was potentially a very interesting talk, but as I haven't watched the PBS show she described, some of it was a bit lost on me I'm afraid. Finally, towards the end of the day, I interviewed CeCe Moore and Angie Bush. Before you watch this, however, I'd like to make just one small clarification regarding 23andMe launching in the UK: although I mentioned in this interview that 23andMe had only just launched its DNA tests in the UK, their non-health related DNA tests have in fact been available to people in the UK for several years. It is the "health-related" element of the DNA test that 23andMe has recently launched in the UK. Like you Rosemary I made genetic genealogy my learning priority at RootsTech/FGS. I used as my topic on my monthly post for February on The Worldwide Genealogy blog. I feel more confident in my understanding but it is certainly a complex addition to our genealogy "tools". Thanks Pauline, I think this is an area which would benefit from being better understood by genealogists generally. 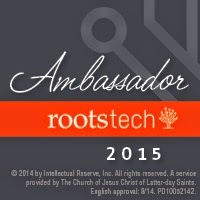 Thanks Rosemary for sharing your experiences at Rootstech. I shall be interested to hear how you get on with your Ancestry DNA test. The 23andMe test has in fact been available in the UK from the outset but it's always been much more expensive than in the US. The health reports stopped after the FDA ban but there was a big relaunch in December 2014 when the health reports became available again. The UK and Canada are currently the only countries where you can get the 23andMe health reports. I'm very pleased to hear from your interview with CeCe that 23andMe will finally be coming to WDYTYA Live. I think we've tended to focus much more on Y-DNA testing in the UK but there's certainly been a lot of interest in autosomal DNA testing at WDYTYA Live. I believe the proportionate number of UK testers is much more than most people imagine but it takes longer for us to find connections. The Americans have had a lot of success stories because so many of them have Colonial ancestry. As a result they all go back to a very small gene pool in the 1600s and 1700s and are related on many different ancestral pathways. We go back to a much bigger gene pool and will have to test many more people to get the same results. Thanks for the explanation Debbie. I now realise that 23andMe was available, but the price made it very uncompetitive. I think their new price is more realistic, especially as it includes a health report. I am now wondering whether to do this one as well! Your point about it taking longer for us in the UK to find connections is a good one.